The LDS Temple in Mormonism serves a special purpose in the lives of Mormons as it is utilized by church leaders who hold the keys to the Temple as a way to ensure standard ten percent tithing and increased loyalty from members. As outlined in the following paragraphs, members who receive a LDS temple recommend must agree to pay ten percent of their income to the Mormon Church, and agree to follow certain requirements such as being loyal to church leaders. Having a temple recommend also serves as a status symbol, as those without it cannot marry or attend marriage ceremonies in the temple, nor can they be sealed for eternity with their father so that they may eternally be together with their family in Mormon Heaven. While the exact percentage of Mormons who receive Temple recommends are not published by Church authorities, a large number do not have them are involved only in local Mormon Ward Church activities. The LDS Mormon Temple is written about in further detail at the website the Mormon Conspiracy to Rule America. It is possible to “borrow” someone else’s LDS temple recommend and gain entry into the Mormon temple, as well as to forge one. However, only a very daring individual would attempt to enter the temple without his own official temple recommend. Laake, for example indicates that she knew of only one person who entered the Mormon temple without his own temple recommend. (1) Do you attend meetings? (2) Are you a full tithe payer? (3) Do you support your church leaders? (4) Do you avoid tobacco, alcohol, coffee, and tea? (5) Are you morally clean? (6) Do you wear the sacred garments? (7) Do you keep the Word of Wisdom? (8) Have you ever been divorced? The pilfering of the LDS temple ceremonies from the Masonic Lodge discredits the claim of the church hierarchy that the Mormon Church is divine. The Masonic Lodge whose rites include memorizing long statements, are recited in the induction ceremonies, and if one ever reveals any of the secrets of the ceremonies he has received within the lodge, he is to have his throat slit and bowels cut out of his body. The oath that Masons take “ to have my throat slit and bowels cut out of my body if I ever revealed any secrets of the Masonic Lodge” was, until recent times, (1990) a part of the oath of the Mormon temple ceremonies. If the Mormon Church is the true church established by Joseph Smith from instructions given by God, why was it necessary to copy Masonic rites for Mormon Church ceremonies? If the temple ceremonies were required by God, wouldn’t He have provided Smith with revelations of his own to guide him in devising the ceremonies? It is understandable that a primary purpose of the secrecy of the temple ceremonies is to prevent embarrassment to the Mormon authorities and members from outsiders who would contend that they were strange. Perhaps in the 1840’s, the time of Joseph Smith, such ceremonies were necessary to attract members and to hold them together, as this gave them some cohesion. Also in Smith’s time, there was no television, no movies and as a result the church was the entertainment center. But today, with the varied choices of entertainment, education, the automobile, travel and other human fulfillment activities, secret ceremonies such as those held in the Masonic Lodge and the Mormon temple seem to be completely outdated. Why is it necessary to have secret ceremonies in the Mormon Church when most other religions are open? Could it be that if the Mormon Church had a policy of openness, too much would be exposed and the religion would die? The Mormon temple depends on numerous workers, generally volunteers, usually elderly men and women who have time to devote to the temple. In the temple are workers who rent the white costumes for the ceremony, and workers who anoint those who are to receive their endowments with washings and anointing. Most of the presentations in the temple are on video, excepting the Salt Lake temple that still has live actors (Mormons of course) playing the various parts in the ceremony. The LDS temple ceremony may last as long as five hours in live sessions. Initiates are first greeted by temple workers and separated into a men’s and women’s locker rooms. They are given temple clothing and all parts of the body are washed and anointed with oil by the temple worker. Initiates are told that it will clean them from the blood and sins of this generation. Members are told that they must not reveal what they are told or what takes place in the temple and they must take oaths to that effect. Many feel after completing the ceremony: “Why should they not keep it a secret. If they ever complete the ceremony, they would be too ashamed to tell anyone what they had participated in.” Many often feel defiled, ashamed and bewildered while going through the ceremony. Some women who complete the ceremony are embarrassed by the “five points of fellowship” embrace by the male temple worker. One complained that the temple worker held her too close which was embarrassing and much too intimate for a stranger. 9 Laake describes the washing and anointing ritual that happened on her wedding day as follows: “Her gentle hands darted beneath my sheet to bless the parts of my body. ...She intoned, ‘I wash you that you may be clean from the blood and sins of your generation.’ She touched my head (‘that your brain may work clearly’) , my ears (‘that they may hear the word of the Lord’), my mouth and lips, my arms, my breast and ‘vitals,’ my loins (‘that you may be fruitful in propagating of a goodly seed’), my legs and feet. Her chanting and her cool fingers were both song and dance, and I was caught up calmed. When she had finished the first round she began again, replacing the water with oil from a dropper that anointed me head to toe....Finally the temple worker leaned to my ear to whisper my ‘new name’ : Sarah. (1) Women learning to obey their husbands in all things so long as their husbands obeyed God. (3) Men receiving the second token of the Aaronic Priesthood and the first and second tokens of the Melchizedek Priesthood with their signs and penalties. Joseph Smith invented the Temple ceremony of Passing through the Veil. It was to show what he imagined would take place when one dies and enters heaven. Smith created a veil which was like secret huge white bed-sheets, with slits in them large enough to put hands through for testing the knowledge of signs by veil workers on the other side, representing the Lord. After testing, initiates pass through the “sheets” to the “celestial room,” representing the celestial kingdom. Part of the ceremony is taking someone through the veil, which signifies entering heaven from earth. During the marriage ceremony when the new bride is “sealed”, not only for time (life on earth) but for eternity (life everlasting) to her husband she is taken through the veil by her future husband. It is ironic that should this sealing of the wife to the husband later result in divorce, the woman often cannot get her temple marriage annulled and remains a wife “for eternity” to her ex-husband even if their marriage for “time” on earth has ended, but the husband can remarry in the temple and have another wife (and another..…) for eternity. And when he enters the celestial heaven after his death he will have two or more women sealed to him (depending upon how many divorces he had) thus having polygamous marriages in his celestial heaven. Women, on the other hand cannot be sealed to more than one man in the Mormon “eternal life”. The LDS Temple rituals of celestial marriage and sealings for young brides often shatter their expectations of an enjoyable experience. Many young Mormons joke about the ceremonies, wondering what a secret handshake or wearing the “garment” has to do with eternal marriage. Laake writes: --- “The mysteries of the world were fraternity rituals (Temple celestial marriage ceremonies). A wild bewildered giggle was forming in my throat. “What in the world was everyone doing? Did all the white-suited glorifiers in the room unquestioningly accept a ritual of nutty gestures from the pseudo-occult as a sacrament? 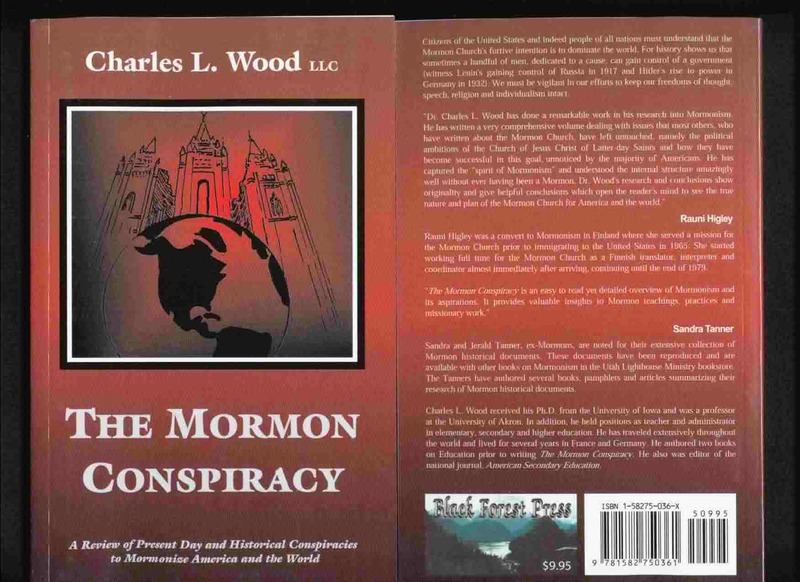 The LDS Temple is written about in further detail in the scholarly book The Mormon Conspiracy. LDS Bookstore Mormon Belief LDS mormon cult LDS Missionary BYU Latter-Day Saints LDS Mission Theocracy Religion freedom Baptism for the Dead Spirits mormon mormons american government u s government brigham young university conspiracy theory book of mormon brain washing joseph smith mind control conspiracy missionary polygamy mormonism World Religion Church of Jesus Christ of Latter-Day Saints Religion and Spirituality Christian Bookstore United States Government Brainwashing Faith Religious Freedom Religious Belief Religious Cult Christian Site Web Christian Christian Church Click the paypal button below to buy The LDS Mormon Conspiracy.